Gillian Huntley, 2015 Kent Aesthetic Practitioner of the Year, of award winning appearances aesthetics is celebrating 30 years in the industry this year. Her treatments have really helped transform the lives of her clients by boosting their confidence through the non-surgical procedures she delivers. As well as specialist treatments such as mole removal, mesotherapy, thread vein/pigmentation removal, skin peels using the Image Skincare range, skin tag removal, Gillian also provides semi-permanent cosmetic treatments such as eyebrow (WoW Brows) and eyeliner tattooing, areola reconstruction, receding hairlines and medical tattooing. Gillian is fully certified so you can be assured you’re in safe hands. So far, all the treatments I have received have been at Gillian’s studio in Chiselhurst so I thought it was about time I had a treatment in her local Edenbridge venue, Options Beauty Salon in Edenbridge High Street. This is in fact where she sees many of her local clients. She conducts initial consultations as well as patch testing on new clients from here and her specialist equipment is fully portable. In the last issue you may recall Gillian tattooed a ‘beauty spot’ just below my eye. She was very conservative with the size initially as she would rather a client return to make something more prominent than go large in the first place! 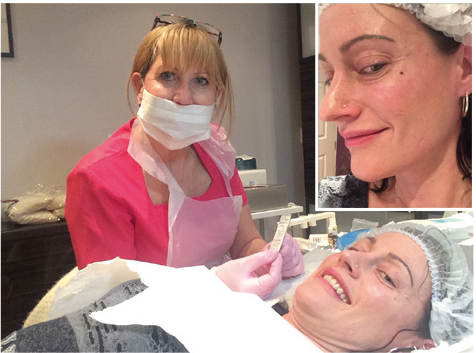 I’ve now become so fond of my beauty spot that I wanted it slightly larger so I met with Gillian at Options for her to carry out this semi-perment make-up procedure. If you would like to arrange a consultation or book an appointment with Gillian, call 07711 067 789 or email appearances4u@me.com.